Venomous vipers like rattlesnakes evolved their deadly toxins incredibly quickly. Scientists had long assumed it was so that they could hunt their prey better, but it might have been to fight off their deadliest predator: the possum. The longstanding assumption was that snake venom is what's known as a feeding adaptation, which means it evolved in response to what they eat. And while we've known for a long time that various mammals hunt these snakes, researchers hadn't yet explored how all this might fit together. 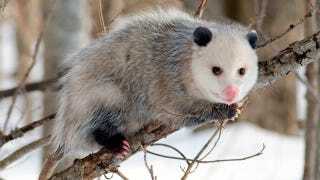 Researchers at the American Museum of Natural History have probed this connection, and they've revealed the shocking truth: rattlesnakes and opossums are locked in an evolutionary arms race. "Snake venom toxins evolve incredibly rapidly. Most herpetologists interpret this as evidence that venom in snakes evolves because of interactions with their prey, but if that were true you would see equally rapid evolution in toxin-targeted molecules of prey species, which has not yet been seen. What we've found is that a venom-targeted protein is evolving rapidly in mammals that eat snakes. That suggests that venom has a defensive as well as a trophic role." There's at least a hundred different opossum species, most of which are found throughout Central and South America. Recent genetic studies into these marsupial species revealed rapid evolution in von Willebrand's factor, a blood-clotting protein that is targeted by the snake toxins. "This finding took us by surprise. We sequenced several genes — including the one that codes for von Willebrand Factor (vWF) — to use in a study of opossum phylogeny. Once we started to analyze the data, vWF was a real outlier. It was evolving much more rapidly than expected in a group of opossums that also, as it turns out, are resistant to pitviper venom. Most nucleotide substitutions have little or no effect on protein function, but that doesn't seem to be the case with vWF in these venom-resistant opossums. The specific amino acids in vWF that interact with toxin proteins show unexpectedly high rates of replacement substitutions. These substitutions undoubtedly affect protein function, suggesting that the vWF protein can no longer be attacked by these snake toxins." "It is so uncommon to find genes under strong positive selection, that the exceptions are really interesting and often conform to one evolutionary circumstance when two organisms are coevolving with each other. We've known for years that venom genes evolve rapidly in snakes, but the partner in this arms race was unknown until now. Opossums eat snakes because they can."